Everyone, it seemed, got involved in the frenzy for ever-more-fancy uniforms and accoutrements, from Napoleon on down. Napoleon I, Emperor of the French, was in a fury over the uniforms issued to his newly created Illyrian Regiment: “Too small, too short, too tight, badly cut, badly made, badly sewed; many of the buttonholes made only with a simple snip of the scissors … sleeves not lined … capotes so tight that they cannot be worn over the uniform coat but they hamper the movements of men who have nothing on but a waistcoat under them; many … are of bad cloth … I want a report!” he wrote in his book called Correspondence on September 6, 1811. And no wonder, for his era of warfare was responsible for the most fantastically beautiful and colorfully arrayed apparel in all the recorded annals of militaria; simply put, Napoleon had an image to maintain. Noted the late Napoleonic authority Colonel John R. Elting in his epic tome Swords Around a Throne: Napoleon’s Grand Armee, “The Grande Armee was a military tailor’s (and military artist’s) delight, yet there was a definite practicality about its uniforms. If gaudy, they were fairly comfortable, and the very gaudiness helped soldiers’ morale. A hussar officer’s uniform might have 156 buttons of five different types, but that same uniform was warranted to make the most down-cheeked sous-lieutenant look like a rider of destiny”— even without modern dry cleaning, steam pressing, and detergents! Here was a veritable riot of the rainbow, from scarlet to puce, from brilliant yellow to golden orange, from bright white to madder red and royal blue. Not too surprisingly, these colors continued in the later French (and other) armies well into the 20th century, until the machine guns of 1914-18 sharply curtailed military haberdashery as a matter of deadly peril in battle. Like George Washington and “Mad Anthony” Wayne before him and “Old Fuss N Feathers” Winfield Scott later, Napoleon wanted his men “dressed to kill,” both as an inducement to them to fight for glory and as a blow to the enemy’s morale and effectiveness, as when he discovered that his Grenadiers’ tall plumes caused their opponents to fire both too soon and too high. Everyone, it seemed, got involved in the frenzy for ever-more-fancy uniforms and accoutrements, from the Emperor on down: “The captain … also purchased the uniform accessories: plumes, epaulettes, shako cords, sword knots, which frequently were made up to the regiment’s own specifications rather than according to War Ministry Patterns,” notes Elting. There was an entire array of shakos and—aside from mere snappy appearances—these also served as handy storage areas for potatoes and wine bottles, as well as—on at least one occasion in Spain by the Berg Lancers—improvised sandbags to repel an attack. There were procurement problems that were rather unique, however, such as “the shortage of bear fur for the caps of the infantry grenadiers and carabiniers and the cavalry elite companies. Scandinavian bears had been pretty well hunted out; resupplies had to be smuggled in from America and were extremely expensive. Therefore, the ministries decided to abolish all fur headgear for the line, leaving it the prerogative of the Old Guard alone,” attests Elting. 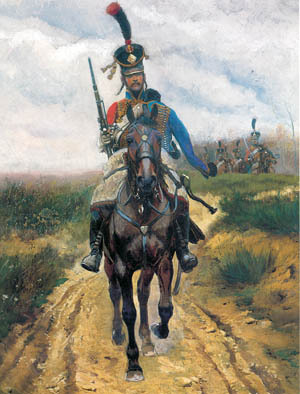 As for hats, the cocked hats of the Royalist and Revolutionary armies were replaced not only by shakos, but also by busbies (fur-covered hats) and the Polish schapskas (tall square-top hats) a variation of which is still worn by the Polish Army today. Tags Anthony Wayne, George Washington, Grande Armee, Napoleonic Wars, swords, Winfield Scott.